After last night’s ride, Critical Mass is getting plenty of press today. From my vantage point, the police seemed to be sending a mixed message. They escorted us out of Union Square with scooters and rode along side the cyclists up to Columbus Circle. As the riders filled Columbus Circle, traffic cops helped block car traffic from entering the circle. There was a similar scene in Times Square as massive crowds lined Seventh Avenue to cheer on the cyclists. It looked like the police had cordoned off most of the side streets in times square with barricades, including 42nd Street. The mood changed as the ride continued downtown on Seventh. There was a lot of traffic and congestion around 34th Street, which was eventually the site of several arrests. The most ominous site was at 14th Street where there were hundreds of cops with riot helmets and loads of plastic handcuffs. This was just a sign of things to come. When the ride concluded at the Saint Marks Church, the police moved in. As helicopters and a blimp hovered overhead the police started making arrests and confiscating bicycles. The fact that it was a Friday night made the scene somewhat surreal. While cyclists were being cuffed and marched off to waiting police busses, spectators where looking on from sidewalk cafes and bars. The reported number of arrests range from 100 to over 260. It is a real shame that a peaceful bike ride had to end like this. Critical Mass serves as a monthly reminder in 300 cities around the world that the streets are not solely for automobiles. Drivers may feel inconvenienced by cyclists utilizing the streets for a couple hours once a month, but how do you think the cyclists feel when they take their life into their own hands every day as they are forced to share the road with drivers who feel a bicycle’s place is on the sidewalk. Bicycles are one of the most efficient forms of transportation, their use should be actively encouraged, especially in densely populated cities like New York. More people should feel free to use their bicycles to get around town, not just for rides in the park. Unfortunately, many people are scared to do so. This is why rides like Critical Mass exist. 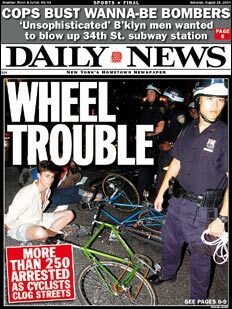 Hopefully the actions of the NYPD last will only serve increase the number of Critical Mass riders in the future. Update: Satan’s Laundromat photoblogger, Mike, was one of the unfortunate folks arrested on Friday night. He has posted a couple pictures and an account of his experience.